When casting housings transmissions and transfer of gray cast iron is often marked by the formation of cracks, which are fixed on the surface of products. To remove usecleaning with subsequent welding or discarded. Key words: Coercive force, x-ray examinations, thermionic emission, crack formation. A new class of nanostructured modifying ligatures AlZr10 b AlTi5 for machining of aluminium alloys was investigated. Assess their structural parameters and the effectiveness of the modification on the example of wrought aluminium alloy АМг4,5 (5083). Key words: Nanostructure, intermetallics, modification, high speed cooling, rapidly quenched ribbon, alloy of system Al-Mg, macrostructure. The article discusses methods of prediction of probability of hot tear formation on large steel castings. Besides, results of examination of physical-and-mechanical properties of grade 25L carbon steel in the temperature range of 20 to 1400°C required for prediction of steel casting crack resistance are presented. An example of predicting the probability of hot tear formation on slag cups is discussed. Key words: Slag cup, gating system, crack resistance, steel casting, hot tears. Analysis of mechanical production of sand molds is given, causes affecting mold and casting quality are specified, methods of mold production quality are proposed. Key words: Sand mold, molding sand compactibility, flask, batcher, molding machine, automatic molding line, molding sand strength. Discussed is the application of a new automatic system (AS) provided with conditions of quick response to examiners’ requests on identifying the types of casting defects, stages of their formation and elimination methods. The system consists of three levels: on the 1st and 2nd level there are considered and selected defects similar to the one under examination, on the 3rd level there are determined causes of formation and methods of elimination. Discussed are variants of revealing and eliminating the hot tear, and blowhole “subcutaneous blowhole” defects. Key words: Automatic system, casting defects, types of defects, visual-and-logical approach, pattern recognition, analysis, brief recommendations, extended analysis of defects, reduction of casting rejects. The article discusses methods of applying individual cast marking to castings. Use of those methods will allow to assign a unique code or number to each casting, ensure production process control, comply with iso 16949 requirement, and track product’s life cycle. Key words: Marking, casting, product’s life cycle, production control. Key words: Chromium-based alloy, scanning electron microscopy, X-ray diffraction analysis, crystallization, electromagnetic field. Supported by the results of examination of the author-suggested aspects of quartz-based ceramic shell mold firing procedure, one has shown that the key processes related to the formatation of quality shell, in general, proceed at temperatures not exceeding 600°C. This creates prerequisites for an approach to this boundary of the firing temperature maximum while realizing the time-temperature mode of this procedure. Key words: Investment casting, shell mold firing, thermo-mechanical, physics-chemical, functional aspects. 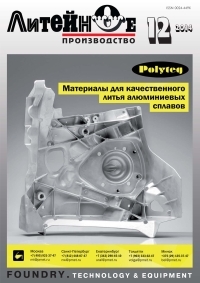 Pistons for internal combustion engines were made by casting with crystallization under pressure. The experimental work made it possible to improve the quality of castings produced. Key words: Casting with crystallization under pressure, die, hydraulic press, niresist insert, alitizing.